For the head of Renault-Nissan, Carlos Ghosn, there is only one way forward for his industry. In an open and candid interview for BBC World Service's The Interview programme, he has outlined how he will be pinning the future hopes of his company in the development of the electric car. He also offers a staunch defence of the often controversial decisions made by governments in propping up car companies during the financial crisis. The Brazilian-born head is credited with turning around the fortunes of both companies when he took over in 1999. Now, he says, he is looking to a future of zero-emission vehicles. "I think the trends we're seeing are all pointing in the same direction," he says. "Oil is a challenge, both price and availability. "Regulations about environments are going to get tougher and tougher. "I think the new generation is much more demanding about respect for the environment than we have ever imagined." 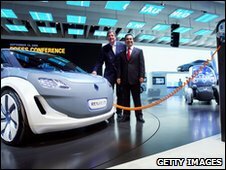 He adds that his company is planning to build 500,000 electric cars per year - and will begin mass marketing in 2011. It's an investment, he says, well in excess of £3bn. But he is prepared to be patient. He predicts 10% of the market will be electric cars by 2020 - and that Nissan-Renault will make up a massive share of that. "We're the only one investing in capacity. So we're going to be the only one with cars on the streets. The massive investment from Renault-Nissan comes with considerable risk. Currently, a fully-charged electric car will travel approximately 100 miles, with a recharge taking about 20 minutes. Critics believe this limitation will put off many potential buyers. But Mr Ghosn says that "80% of the people on earth, driving a car, drive less than 100km a day". "Let's not forget this is a technology which is starting, is going to mature, is going to get better and the range is going to go up." Alternative cleaner fuel options could turn out to be another risk to Renault-Nissan's strategy, but Mr Ghosn dismisses biofuel as a competitor. "Biofuel is better than gasoline, but it is far from as satisfying [environmentally] as electric cars." For him, the only real alternative is fuel cell cars running on hydrogen. "It is a very promising concept," he says, adding that for now, the associated costs are still too high. He is confident, however, that electric will prove to be the front-runner when more research and development has taken place. "We'll probably have divided the cost by three. We'll probably reduce the size by as much. "Even the range is today much more reliable than before. There are plenty of improvements in terms of safety, reliability, cost, weight which have been done - and it's not finished." Mr Ghosn is resolute in defending the actions of various governments who opted to financially support struggling car makers during the financial crisis. "If we're enjoying support I don't think it's because all governments are car fans. I think it's because they're job fans. "We are big employers, and nobody wants to see a big chunk of employment disappear from their own country. "We need to be very realistic about it. Everything which helps employment is going to be seen well by the different governments, and they're going to be supported." However, he did say it was right that not all car companies were saved, saying that in some cases, collapses were due to fundamental competitiveness issues. Additionally, he does not believe that governments will fall foul of World Trade Organization rules. "What happened between October 2008 and March 2009 was really exceptional. "I don't think you can take this period as representative of the willingness or not of governments to intervene or not to intervene into their economy. "Everybody was panicked. These were extraordinary circumstances and everybody was happy to be able to save big chunks of activities." Mr Ghosn discussed the extent of government intervention in car companies' expansion plans. 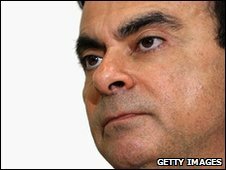 Nissan made headlines in 2002 when Mr Ghosn told BBC News that the company's Sunderland plant's future relied on the UK joining the euro. Some reports at the time suggested that the prime minister at the time, Tony Blair, was prepared to negotiate on those terms. Mr Ghosn denies this. "He never promised me something like this. The Interview is a weekly programme broadcast on the BBC World Service . "A lot of things have been written about it which were frankly based on nothing." He does say, however, that governments have a very active, and often competitive, role in determining car company actions. "When we go to China today, and we want to select a place where we want to make a plant, there is a competition between the provinces. "We have the same thing in India. "This is not something that is linked to one country - this is due to the fact that a car company coming and building a plant is going to transform your life." "We are always being asked what helps you to be competitive, and what is an obstacle to your competitiveness. "It doesn't mean that the government is going to act on every single thing, but I think it's very important that you can tell governments that this is good and this is bad for us. "They need to hear it."